In an extract from her just-published book, Inspiration Meditation, (part of the Go Creative! series) Orna Ross, bestselling novelist and poet and Director of The Alliance of Independent Authors, introduces the connections between inspiration and meditation, which led to the creation of her own style of meditation. Like meditation and the love, happiness and peace with which it is so closely aligned, inspiration is mysterious, nebulous and hard to pin down. That doesn’t mean, though, that we can’t reach an understanding of it, learn what conditions make it ours and foster those conditions. That is what inspiration meditation teaches us — at the level of experience, not thought. Inspiration has two different meanings. The first is a physical process: inspiration is the act of inhalation, of breathing in; the second to a mental process, the flashing into awareness of an idea or insight, as if from nowhere, out of what is sometimes called the unconscious or the subconscious, the creative mind space. They are aligned, as we see when we focus on our breath in meditation. We’re all familiar with the thought pattern of inspiration and have lots of different expressions for how it manifests, speaking of how an idea arrived “out of the blue”, or “dawned” or “popped up” or “suddenly hit” us, “from nowhere”. These point to a common experience of the breakthrough of ideas or insights from a creative level of consciousness that feels deeper and is obscured from our everyday consciousness. Consciousness, as described in this way, is a kind of shorthand. There is no such thing as a discrete, identifiable brain entity called “the creative consciousness” or “the conceptual consciousness” or “the unconscious”. These are ways of describing dimensions (we might prefer to say aspects, or modes) of human thought, necessary to understanding the creative process and the role of inspiration in that process. Inspiration has always fascinated philosophers and psychologists and, like every human experience that largely evades analysis, has gathered around itself many symbolical “explanations”. · In ancient Greece, inspiration was believed to emanate from the muses and certain gods, especially Apollo and Dionysus. · Socrates held that it was a “kind of instinct” that united poets and prophets, enabling them to “deliver all their sublime messages without knowing in the least what they mean”. · The Christian tradition promotes the idea of inspiration as a gift, a “grace”, from the holy spirit. The idea for Inspiration Meditation came to me while lying in bed, halfway between wakefulness and sleep, as if from nowhere. What was going on at the moment when this breakthrough occurred? The insight came to the forefront of my thoughts by breaking through a previous thought pattern. I was happy with my meditation method, I had been loyal to it and it had been protective of me. Yet here was this new and unexpected way of doing things. As well as excitement, I felt a low-level guilt and resistance. Wasn’t I being more than a little ungrateful to my current meditation method which had served me so well? And what would happen if I made this part of my life? I knew how I always liked to spread anything that worked well for me but I didn’t want to be a meditation teacher or anything like that. I was a writer, not a teacher. As a writer, though, I’d long learned to observe such thoughts and feelings and recognised them as creative anxiety. I knew that, as Picasso put it, “every act of creation is first of all an act of destruction.” That’s why true creativity is always a bit scary. That’s what makes it exciting. Another thing that happened that night was everything suddenly seemed vividly and intensely alive. From a state of sleepily drifting in the semi-darkness, I clicked into intense awareness. I could see the furniture, the windows through which a small amount of street light was shining, the ceiling above, the glow of white from the pillows and duvet, the tousled head of my sleeping partner. The aliveness of everything, and a sense of fusion between all, was palpable; that special translucence that you experience in meditation had enveloped my world without me sitting or trying or even asking. 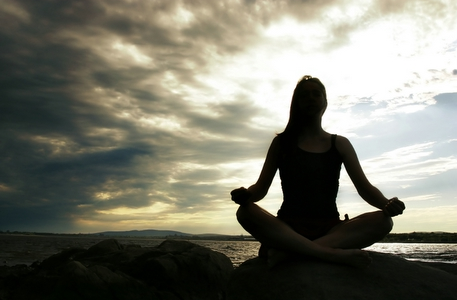 Perception, awareness, presence: these are characteristic of both meditation and inspiration. This is where they meet and feed each other. In many ways they are one and the same, both mysterious but both also very simple, once you understand them as skills. This is an extract from Inspiration Meditation, a “How To Meditate” Guide from novelist, poet and Director of The Alliance of Independent Authors, Orna Ross. Inspiration Meditation is designed to cultivate creativity, ideas and insights. It is not just for writers and artists — though they will find it intensely useful. Inspiration Meditation is for anyone who wants to master the art of conscious creation and apply it to any aspect of life.